Biography & Genealogy: Philip Foulke Frazer, Class of 1864: Born- Dec. 22, 1844. Matriculated from Lewisburg, West Virginia. At VMI 1 year. 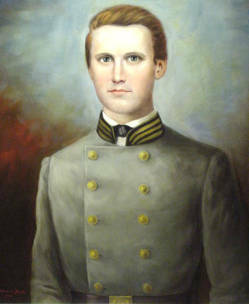 Military Record: Served as a Drillmaster in Richmond during the spring of 1861; entered service at Camp Harmon on August 25 (or 22 or 26), 1861 for 1 year as a 2d Lieutenant, Company G, 27th Virginia Infantry Regiment; elected Captain on April 23, 1862; At Cedar Mountain, he captured 1 US Captain, 1 US Sergeant, and 2 US Privates, and presented them to Major General (Later Lieutenant General) T.J. "Stonewall" Jackson; roll from April 30-Oct. 31, 1862 shows him absent wounded (no date for wound given); praised for conduct at Chancellorsville; on committee of 5 officers that got the brigade officially designated the "Stonewall Brigade;" promoted to Major on Oct. 7, 1863 (date of rank Sept. 4); in hospital at Charlottesville Oct. 22-Nov. 4, 1863 due to dysentery; Killed in Action at the Wilderness. Died: Killed in Action May 5, 1864 at the Wilderness.